I am looking forward to a bit of Caramia-time this fall to wrap up a few sewing projects for others, as well as doing some apple-picking and canning / preserving stuff from my garden. I am actually on a bit of a deadline with my non-selfish sewing, so I need to get at it! I was commissioned by a good friend to make her a skirt, and she is leaving for Switzerland at the end of the month to visit her family there so I only have a bit of time to get things all wrapped up! She wanted an A-line style skirt out of a bluey-green cotton voile so I used this free Twinkle by Wenlan pattern and used white binding tape as an accent. The pattern is okay, but I think that having to print it on 50+ pages is a bit extreme, especially when the pattern could probably utilize folding the fabric at the mid-point. Also, the fit seems a bit small - I made a size 12 for my friend even though her measurements were for a size 10 (normally I find most sewing patterns fit best if you make them a size smaller than what your measurements say you are). Anyhoo, it's nearly done, I just have to finish a few seams, put in a zipper (always a challenge for me) and then hem it. The second unfinished project is a purse for my husband's grandmother who is turning 90 (!!!) on September 11th. She was moaning a few months ago about how she would like a small purse and how everything these days is just so big. (She is actually one of the funniest people I have ever been blessed to know and I completely adore her, so keep in mind that I am often sarcastic when describing her!). I personally am a fan of the large duffel-bag sized purse because I tend to haul around all kinds of stuff with me on a daily basis which probably explains some of my back problems, ha ha ha... I used Butterick 6856 which I've had in my pattern stash for ages, and used a heavy black brocade fabric as well as notions which I've "harvested" from an old Gap purse of mine which is actually worn out. If you didn't think purses could get worn out - think again! I've had this baby for over 10 years and it's been on numerous trips including a 3-month backpacking adventure around Europe in 2008 (see our blog for more details - be warned it's rather detailed!). I would say it's about 3/4 of the way finished; thankfully it's a long weekend so I will actually have time to get some work done on it! Two of our friends have very recently had babies (i.e., within the past week and a half), so I have a bit more baby clothes to finish up. So far I have made a pair of pants for little M using the leftover fabric from an up-cycle I made for my hubby. I haven't had a chance to sew anything for little S but I am soooo excited to make some baby girls' clothes since everyone seems to have been having boys lately! 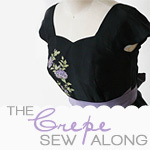 Oh well, I will add it to the ever-growing To Sew list... I hope you all have a wonderful September and that all good things come your way! Self Stitched September Lite - Extremely Lite! Summer Sewing Projects - Summary!